Relyence Corporation has just released the latest version of the Relyence Quality and Reliability platform. Offered as either a cloud-based or on-premise solution, Relyence incorporates the latest in technology with the best in R&M analytics for a comprehensive suite to meet and improve corporate quality objectives. 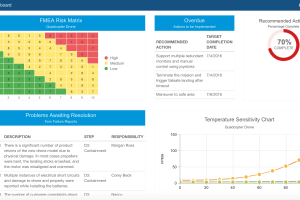 The Relyence suite is comprised of FMEA (Failure Mode and Effects Analysis), CAPA/FRACAS (Corrective and Preventive Action/Failure Reporting, Analysis, and Corrective Action System), Fault Tree Analysis, and Reliability Prediction modules. Relyence 2016 Release 2 introduces a host of new powerful features and capabilities to the Relyence suite. Relyence FMEA is a flexible and pwerful tool supporting a broad range of standard methodologies including AIAG, SAE, MIL-STD-1629, and completely custom formats for Failure Mode and Effects Analyses. Additionally, you can use Relyence FMEA to manage your Process Flow Diagrams (PFDs) and Process Control Plans (PCPs). Relyence FMEA’s newly introduced unique always-in-sync™ technology means that your analyses are complete, efficient, and effective. Relyence FRACAS provides a robust platform for tracking and managing your Failure Reporting, Analysis, and Corrective Action System. Relyence FRACAS ensures that your process is in compliance and under control with a completely customizable process flow, built-in escalation of incidents to problems, and workflow features. You can effectively manage your product, process, or service related issues to monitor health, safety, risk, and environmental concerns. Relyence FRACAS can help you meet your ISO-9001, ISO/TS 16949, AS 9100, and APQP requirements. Relyence FRACAS includes out-of-the-box support for 8D, DMAIC, and PDCA processes, as well as offering support for fully customized FRACAS processes. Relyence Fault Tree Analysis (FTA) is a top-down, deductive technique used to determine the probability that undesired events will occur. You can model safety and risk of many types of systems, from human processes to complex interactions that occur in electro-mechanical systems. Relyence Fault Tree provides a powerful platform for constructing fault tree diagrams, modeling input events, and performing a variety of calculations to assess the likelihood of undesired events and the combinations of contributing factors that would cause those undesired events. Relyence Fault Tree support a wide array of gate and event types, and various calculation results including unavailability metrics, importance measures and minimal cut set (MCS) generation. 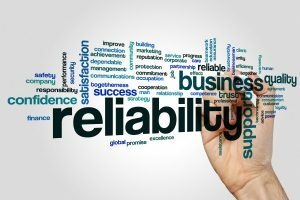 Relyence Reliability Prediction is a modern, friendly, and powerful tool to assist you in doing your MIL-HDBK-217 reliability predictions. Relyence Reliability Prediction augments complete failure rate and MTBF analytics with data entry ease, a built-in component library, support for custom user component libraries, data import and export capabilities, and flexible reporting and charting outputs. The Relyence product suite is built on a well-crafted integrated platform, so that your quality and reliability data is integrated for maximum benefit. For example, the Relyence Analysis Tree provides a unifying factor for all your activities. You can define your product or system components and structure in one place, and use it across all your analyses. Data flows seamlessly between modules as necessary. For example, you can see your predicted MTBF values alongside your field-tracked MTBF metrics based on your FRACAS incident reports. The value of the Relyence platform is that you can utilize the integrated framework if you desire, but can just as easily allow each module and corresponding data to work independently. The choice is yours, and can be adapted over time to suit your needs. Relyence 2016 Release 2 offers a significantly improved experience for your Process FMEAs (PFMEAs). Relyence PFMEA incorporates all of the steps in a well-designed and efficient PFMEA analysis, including the Process Flow Diagram (PFD), the PFMEA Worksheet, and the Control Plan (PCP or CP). Relyence’s PFMEA support is flexible so you can use only those components you want, in any combination you want. For example, you can use just the PFMEA Worksheet, the PFD and PFMEA Worksheet, or even just the Control Plan portion. You can also start with one component and add others on later if you desire. Typically, you begin your PFMEA by defining your process flow. With Relyence PFMEA, this can be done using the visual, graphical view using our Block Diagram functionality to create a Process Flow Diagram (PFD). The PFD Editor enables you to create your diagram with PFD symbols and make connections to indicate the process flow. The PFD can be as simple or as complex as you desire. You then move onto the central work of your PFMEA: completing the PFMEA Worksheet. 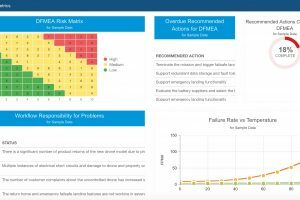 The heart of your FMEA task takes place in the proven, intuitive Worksheet view, complemented by the form-based view for drilldown low-level data capture and in-depth review. Lastly, you can create a process Control Plan (PCP or CP) to ensure your process control methods are documented and maintained. Relyence 2016 Version 2 introduces the unique always-in-sync™ technology to organize your control plans along with your PFDs and PFMEA Worksheets. This ensures that FMEA data remains in sync throughout all steps in the process – from PFD to Worksheet to CP. A change or update in one place automatically flows to all related elements. Relyence FMEA keeps track of product and process characteristics, prevention and detection controls, and process steps. This means that you are assured that nothing is “lost in the shuffle” for any reason. You can be confident that your PFMEAs are complete, organized, and efficient. Relyence Visual Block Diagram capability supports the creation of visual representations of your product, system, or process. Block diagrams can be very useful for providing an easy-to-understand overview of your entire system. Relyence FMEA, Relyence CAPA, and Relyence Reliability Prediction incorporate the Analysis Tree as the central definition of your product or system. Your Analysis Tree can be modeled using the common expandable/collapsible hierarchical interface. In addition to, or instead of, the hierarchical interface, Relyence offers the ability to model your product or system in a graphical diagram format. Relyence can auto-generate your initial block diagram based on your Analysis Tree, then you can modify and enhance from there using the Block Diagram Editor. In Relyence PFMEA, you can use the Process Flow Diagram (PFD) Editor to create a graphical view of your process. The PFD Editor is functionally equivalent to the Block Diagram Editor with symbols specific for use with PFDs. With both Block Diagrams and PFDs, you can use your diagram in conjunction with, or in place of, a tree or table view of your information. Relyence dashboards provide an at-a-glance overview of your analysis information. Combining the data you need for quick assessment, dashboards offer the ability to monitor and manage your quality and reliability analysis information. This overview enables you to quickly gauge system health. Relyence supports the ability to create any number of distinct dashboards and view them each with a click of the mouse. Dashboards are customizable with the Relyence Dashboard Editor. The Editor enables you add and place widgets onto your dashboard palette in any manner. 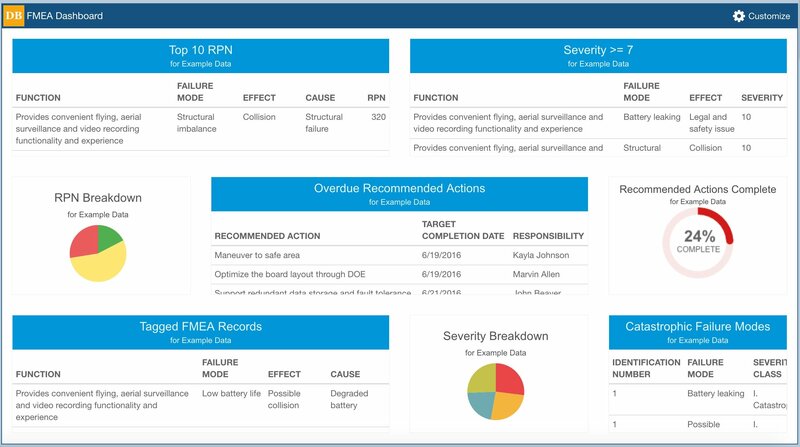 You can incorporate data from any Relyence module into dashboards, including Relyence FMEA, Relyence CAPA, Relyence Fault Tree, and Relyence Reliability Prediction. You can create separate dashboards on a per-module basis, or combine analysis data from across different modules into one dashboard. All Relyence dashboards support drilldown. Drilldown enables you to click on a specific item in a dashboard widget and be taken directly to the underlying Analysis and corresponding data. All Relyence tools are built on the Relyence platform – a highly adaptable and mobile-friendly framework constructed with today’s workplace in mind. Relyence can be hosted in the Microsoft Cloud to take advantage of the Microsoft’s industry-leading Azure platform, hosted in your own private secure cloud, or installed on-premise at your location. The Relyence Cloud solution, which offers the security, reliability, and convenience of one of the most trusted cloud platforms available: Microsoft Azure. Hosting in the Microsoft Cloud provides you with access to your tools anytime, from anywhere you have an Internet connection, on any device with a browser. We take care of all upgrades and installations for you, as well as data backups. With the Relyence Private Cloud Solution, you have all the advantages of a cloud-based tool, but hosted on your own internal, private cloud. This option is best when your organizational policies or other factors do not enable you to use a public cloud tool. You still have access to Relyence anytime, from anywhere, and on any device. Your organization has complete control over the management of this cloud resource and your Relyence solution. If you prefer, or are required, to install your applications locally on your own hardware, you can choose the Relyence On-Premise Solution. You install Relyence on the hardware of your choice and handle updates and backups yourself. The Relyence On-Premise Solution offers all the features and capabilities of the cloud solutions. Anytime, anywhere access: Whether you choose to host in the cloud or on-premise, Relyence’s web-based applications allow you to access your data anytime, anywhere. Device independence: Supporting any OS, browser, or device, Relyence’s responsive, cleanly designed applications can be accessed from your desktop computer, your tablet, your iPad, and even your smartphone. Design elegance: We believe in designing, developing, and delivering amazing products. This means you’ll find the Relyence tools the most intuitive and advanced analysis tools available. Improved collaboration: Relyence’s applications are designed from the start to support team collaboration. We recognize the ever-increasing demands of today’s distributed workforce and fast-paced environment and built our tools to handle it. No training requirements: Our well-crafted interface and intuitive design allow you to jump right in and start performing analyses in no time. Additionally, our support team consistently goes above and beyond. We offer a free fully functional trial of Relyence – sign up for your free trial today. Feel free to contact us to speak to us directly about your requirements or to schedule a free webinar.